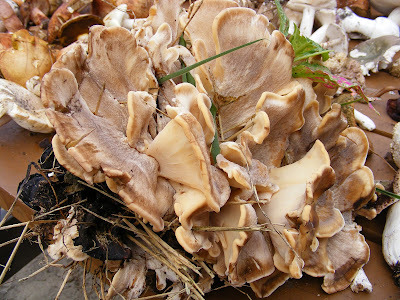 The Kitchen Genius has wanted to gather wild mushrooms for a couple of years now. He has four different books that he pores over every so often, but I’m not convinced I trust his identification skills. 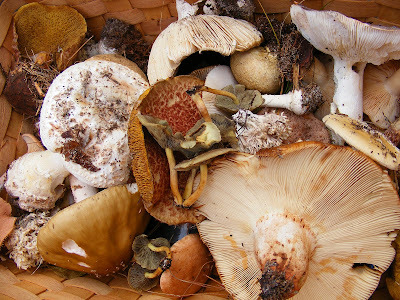 We were in full foraging mode when we discovered a local mushroom gathering class taught by Lawrence Schuster, a member of the Boston Mycological Society. We joined a group of about 25 people gathered at Nickerson State Park one morning about a month ago. Lawrence gave us an overview of the different mushrooms we might find and each description made me even more uneasy. There were mushrooms that could make you hallucinate, mushrooms that could give you a pretty bad bellyache and mushrooms that could KILL you. Cue scary music here. 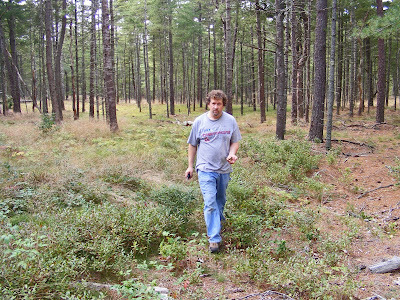 He then sent us off into the woods for an hour to see what we could find. At first it was hard to spot any mushrooms, but the one thing I’ve discovered about foraging is once you find the first couple of whatever you’re gathering, it’s like you discover a new set of eyes. Pretty soon our basket had a respectable collection. It was a bit addictive and we found ourselves alone in this beautiful grove of pine trees. The grass was matted down in spots where it was obvious deer had slept and it was so peaceful – until we found the first deer leg bone. We were in an area not far from our house where I hear coyotes howling like raucous teenagers at night. I looked around, wondering where the coyotes go during the day. Another leg bone and the remains of a freshly killed rabbit increased my unease. When we saw a five foot long snake stalking a chipmunk, I decided it was time to head back. We had plenty of mushrooms in our basket. 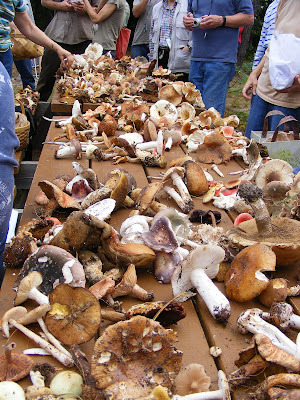 Everyone piled their mushrooms onto two picnic tables and waited for Lawrence to tell us what we could actually eat. That smart man did no such thing. He identified a lot of mushrooms, but basically said we were all much too new to mushroom gathering to eat anything we found. Out of all those mushrooms, there was only one that he would give his blessing, the Hen of the Woods. The man who found it shared a piece with us, but when we got it home, all those warnings scared me. I went online to do more research and discovered that Hen of the Woods is one of the safest mushrooms because nothing else looks like it. 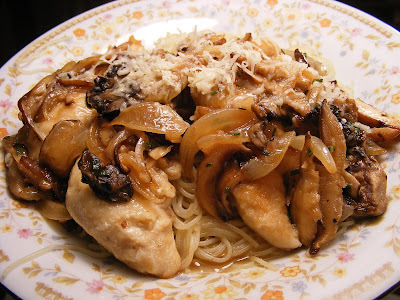 KG made a simple chicken and pasta dish with boneless breasts, white wine, onions and mushrooms. Every bite felt a bit dangerous and the Hen of the Woods was a bit tough (probably because it hadn't rained in a few days). Since then Lawrence has sent at least 10 emails warning those in the class against poisonous mushrooms, including one about a local mother and her son who got very sick from mushrooms they found in the forest. ohhh I would not have lasted that long out there...no no! I hate that howling sound at night during the summer. Eeeek. no need to fear I hunt shrooms all the time - hen of the woods is by far the safest! It scares me too. On our vineyard property we found morels. I swear I did not want to eat them even though we were sure. 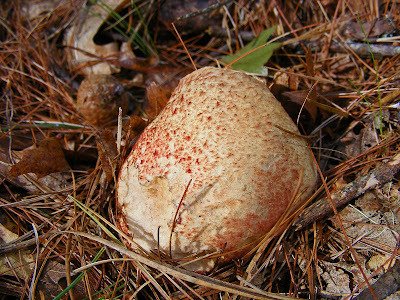 So we ate them and lived but I swear every thing I felt for two days I was sure it was the wild mushrooms killing me. OMG...those mushrooms..yum! I loved hunting mushrooms as a kid, can't find that many in Ohio now. Thanks for stopping by my blog...you are appreciated! Someday I'd like to undergo the same process of gathering information, courage and then executing a plan. But your fear, like mine, reminds me of why it's so worthwhile to pay such a price for rarer varieties of mushrooms - you're paying for their expertise and hopefully your safety. The thrill of this adventure is luring, and I'd still like to do this someday! There is something about foraging for mushrooms that takes me back to a time when things were simpler, yet worthy of the effort. I love cooking with wild mushroom when I can get them. What fun! I wish there was a group like that here. I read somewhere that in France the pharmacists are mushroom experts. What a huge haul of mushrooms! I feel your fear. I would rather be safe than sorry. That sounds like a fun morning! Although I think between the snakes, coyotes and killer mushrooms I'd stay home with some safe boiled rice or something! I am with you - I only buy my mushrooms from the store or the farmers market.